Devarayanadurga is yet another hill located near Tumkur. 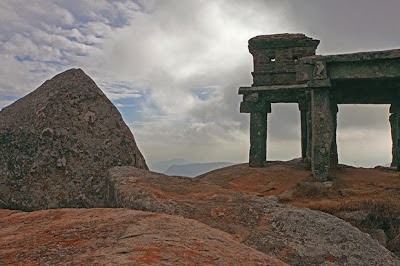 While Shivagange [a trek destination] comes to the left of Dobaspet, this one is located to the right of Dobaspet (if you come from Bangalore). A major part of the climb consists of just steps ( and monkeys accompanying you :P) until you reach the Yoga Lakshmi Narsimha temple towards the peak. The path henceforth [1/4th of the climb until the Peak] - though a short distance - is quite challenging climb over small steep rocks, and narrow passages inside thorny bushes. Soon, we reached Dobaspet, had our breakfast there, and then travelled further to reach the base of the Devarayanadurga Hill. At the base, the 12 girls were split into 6 pairs of 2, and after a short photo session, we started climbing the steps alongwith our partners. After a few minutes of climb, we came across large sculptures of Lord Hanuman, along the sides of the rock, that have been now turned into an unenclosed temple. After a brief round of photo-session and 'Mohabbaten poses' we decided to climb further. The lead pairs marched forward, and had just crossed this temple when we hear a yell from behind - 'My Shoe, My Shoe. My 4000 Rs Shoes' [ I remembered the 'price-tag' from the movie - 3 Idiots :P]. Turn around, and found out it was the same WOW miscreant - Viji (who has done utpataang harkat before too :P :D). Apparently, she had removed her shoes (forgetting to ask someone to watch them) to get inside the temple and pray, and before she could grab her shoes back, a monkey had taken it and zzzzoom thrown it somewhere down inside the bushes, without an aim :D. It took sometime for our Heroes - Krupa, Shilu and Viji herself - to figure out where exactly the shoe was thrown, descend down and get it back from the bushes. Baaton baaton mein, we reached the temple near the peak. We first entered a small cave right adjacent to the temple, called as 'Sripada Cave' [which was a little scary], and then some of us had darshanam inside the Lakshmi temple and a nice View from the temple's balcony behind. After the temple is where the actual trekking starts. We went further the temple and started climbing the rocks. Along the passages, you will find dry thorny bushes and need to be careful (protect your face - eyes especially) as the thorns are low-lying (no danger though, just a caution :P !). After a brief climb, we reached the Peak spot. Strangely, as soon as we reached the peak, the hot-sunny-humid climate turned into a mild-cloudy-breezy atmosphere [though there were sun beams now and then, but not as hot as it was while climbing throughout]. We decided to have lunch at the peak . As usual, our Annadaata's got food for the entire group [this time with sweets too, since they recently celebrated their Bdays:)]. After having hogged the nice home-cooked food, it was time for some relaxation. Some of us chose to take a short nap, and the rest of us just scattered ourselves around the pillars at the peak, contemplating Nature's beauty and the weather, all by ourselves. After sometime, we even meditated (in our own ways), when one of our Annadaatas Shalini, played a Chinese meditation music [co-incidentally, I have had been searching for this music off-late, and was thrilled that she had it :D]. The music just added to the peaceful ambience that was already present. Experience!! A little further to the Devarayanadurga hill, there's a Deer Park and a natural water spring called 'Naamada Chilume'. It found its name from a short story of Ramaayana and is of mythological importance. Again, had a peaceful stroll inside the park, walking, and more story-telling, and expressing our fantasies with Indian mythology; until it was time for return..
After the Deer sanctuary visit, we had a tea break, and then set out for Bangalore. The newbies now initiated Antakshari - and we had full-on fun singing new-old-older songs [we ensured our opponents get only 'na' at the end of the song..and kept them wondering till the end as to how did we manage to do this :P].